This precedes 1028 pages of numbers and words that will define my life for the next semester. I know I am stressed because I can feel it in my temples, jaw and neck. I presume this means I am clenching my teeth. I know I am stressed because I have a persistent ache in my shoulders that sometimes travels down my arms to my fingertips and cascades down my back. I know I am stressed because I have a headache all the time. And I know why I am stressed. Sure, it is true that I am in way over my head in this stats class. It is also true that I have a stressful semester as I am teaching two new classes with a total of 85 students. And I am equally sure that a complete change of routine – even moving to a new office, increases stress; at least until I get used to things. But, that is not why I am stressed. I am stressed because I think I am in control and that makes me panic. But, I am not in control, God is. God loves me, no matter what. He doesn't ask me to do anything to earn that love. He just loves me, because He is God; He is my creator; He is my Savior; He is my Comforter. And He knows about multiple regression analysis because He created it. He doesn't look at me and shake His head. He doesn't grumble to Himself "If only she would trust me. It's not like I haven't solved problems for her before. Will she ever learn?" He doesn't do this. Instead He loves me, forgives me, comforts me. Because of this all encompassing agape love, He teaches me to trust. If it is God's will, I will pass this class. If I can get my teeth to stop clenching I might even learn something. If it is not God's will for me to pass, He will bring good out of it. I have seen Him do it before; He will do it again and again and again. Thank you Kim, and may the Lord Jesus give you His Shalom - body, mind, and spirit for the days to come. And girl, schedule yourself a massage! My last semester of grad studies...not nearly as intense as yours...but indeed, the stress I suffer is also because I think I am and have to be in control. But I'm not. When I think I am in control FEAR overwhelms and anxiety finds it's way into every nook and cranny of my body. He beckons us with rest, His way, and "rises to show us compassion." He is our "very present help in times of trouble...our mighty fortress, our strong tower." And He doesn't care about the C- I got this summer in a class because I was on overload. And he doesn't cross his arms and shake his head in chastisement but opens them wide, welcomes me in, and comforts me...enfolds me. I hope your teeth stop clenching...if I were taking stats at any level, I would have lock jaw. I will keep you in my prayers and celebrate His grace for you. Thanks for writing! 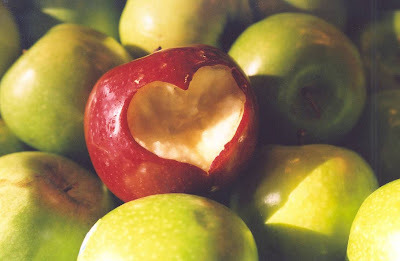 I will eat my Golden Delicious apple today with this in mind!